by taking night classes at NIU-Hoffman Estates. Northern Illinois University and five northwest suburban community colleges have teamed up to offer a new path for students seeking degrees in business administration. 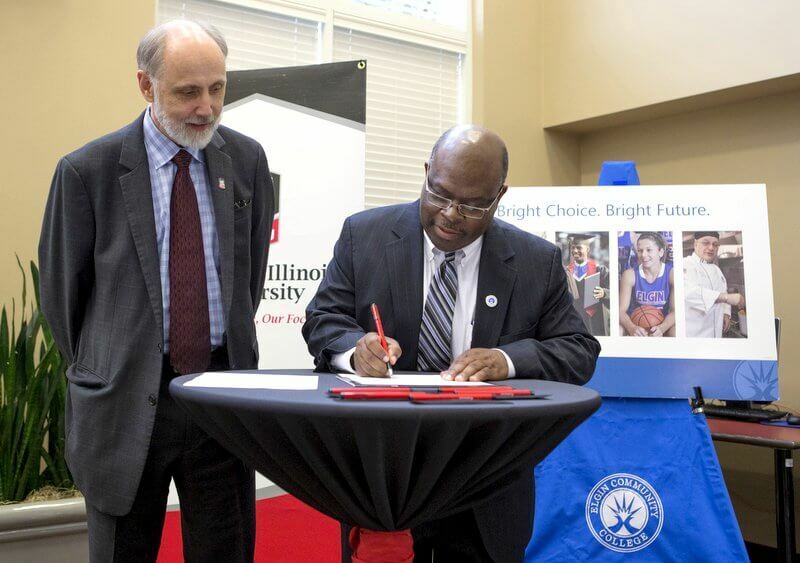 The agreement was unveiled Friday at NIU-Hoffman Estates with representatives from NIU, Elgin Community College, William Rainey Harper College, College of Lake County, McHenry County College and Oakton Community College on hand to sign and celebrate. The program is designed primarily to meet the needs of non-traditional students who are unable to attend classes during the day because of work or family commitments. It marks the first time that the NIU College of Business has offered students the opportunity to complete all upper-level degree coursework offsite and at night. 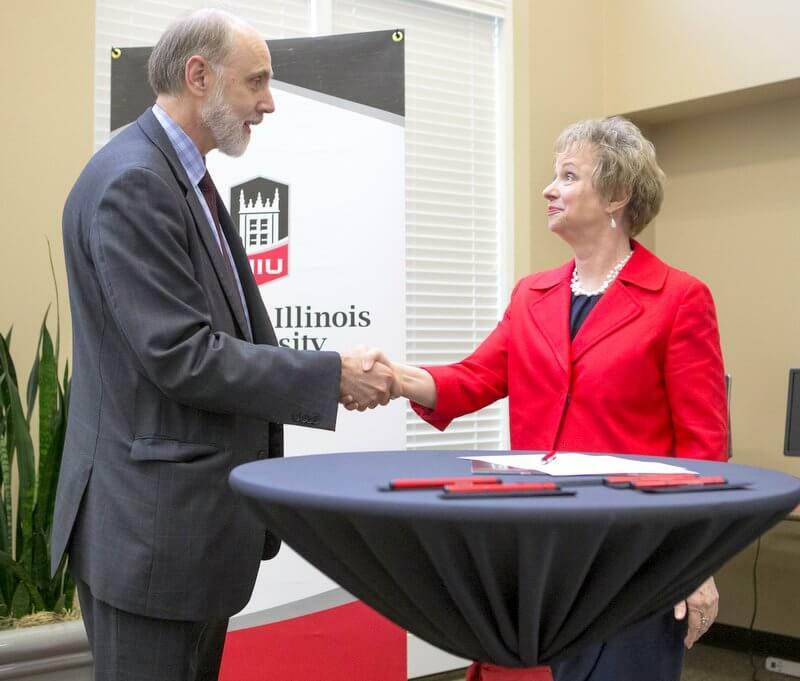 The program arose out of a conversation between NIU President Doug Baker and presidents from the consortium of community colleges. Many students were in need, they said, of high-quality, affordable business degrees to help them land jobs or advance in their careers – but they could not commit to a standard college schedule. Recognizing the broad benefits of such a program, Baker worked with the NIU College of Business to set things in motion. The location and time-frame of the classes are the only two things that distinguish the program from the experience of a traditional transfer student who attends two years of classes at a community college and then enrolls at the university’s flagship campus in DeKalb, Marcellus said. In either instance, she said, students must complete the same set of coursework, meet the same standards for entrance into the college and receive all upper-level instruction from NIU faculty. the agreement. Five community colleges were included. Details are still being worked out, but the Hoffman Estates program likely will be designed along the lines of an MBA program. Cohorts of students will progress together through a tightly defined curriculum. Semesters will be condensed, and classes offered year-round, so that students can complete their upper-division work in as little as two years, attending classes nights and perhaps weekends. The program could start as early as this fall, but will require a minimum enrollment of 20 students. It might take a semester to raise awareness and get students into the pipeline, Marcellus said. Denise Schoenbachler, dean of the NIU College of Business, is excited to get the program up and running. The community college presidents at Friday’s event were similarly excited at what the program will mean to their students.